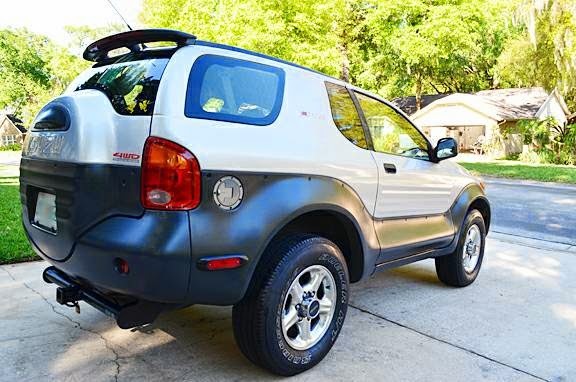 The VehiCROSS was a compact SUV from Isuzu released in 1999 as a futuristic off-roader. It features a compete chassis, black plastic body cladding and a daring body shape that was like nothing else on the road. Today the VehiCROSS is well depreciated, but they only made 4200 for sale in the USA - so if you want a museum quality version, you should act soon. 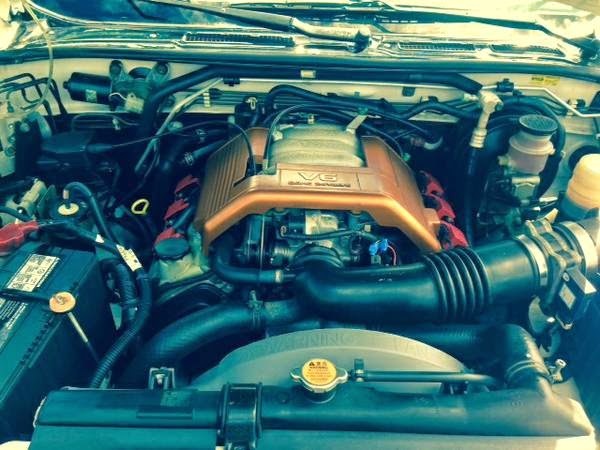 Check out this 1999 Isuzu VehiCROSS for $13,900 in Kaneohe, HI via craigslist. Tip from Gianni. The VehiCROSS was introduced as a concept vehicle at the 1993 Tokyo International Auto Show. Most cars go through a significant styling exercise to de-concept them and prepare them for mass consumption, but the VehiCROSS looks a lot like its concept version...which is probably why it was never consumed en masse. The VehiCROSS shares much of its components with the 2nd generation Trooper, but its MSRP of $31k when new was quite high. The VehiCROSS is powered by the Isuzu 6VE1, a 3.5 liter DOHC V6 that puts out 215 horsepower and 230 ft-lbs of torque. Straight line performance won't be remarkable, but the VehiCROSS was designed for scrambling up loose surfaces and features Isuzu's Torque-On-Demand 4WD system and remote reservoir shocks, typical for a Baja 500 racer, but unusual for a production vehicle. Inside the VehiCROSS is gaudy, and logical to assume that anyone willing to buy a car that looks like the moon rover on the outside would want a clown car interior. The Ironman edition that the seller mentions is a homage to the Triathlon, not the flying super hero (unfortunately), but the details for the Ironman edition escape me. Why only one dimly lit pic of the front? Was it hit there? Looks like the grille is missing. Didn't they make these in manual? Auto wouldn't be much fun. Unique, yes, but parts availability must be non-existent. A cool car for its time, but it's time (late 90's) wasn't a very cool time for cars. The grille is just those two fangs set against some kind of black honeycomb from the factory - doesn't look like anything is missing here. Another car that I am irrationally in love with. Thanks DT. These only came in automatic, The Ironman edition is the addition of decals only and in white only. Bought one new and still driving it and loving it. 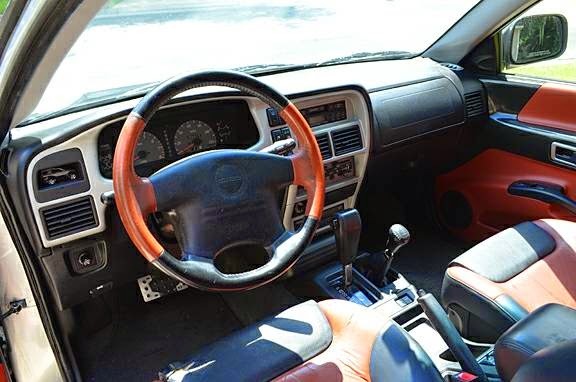 The interior is no more gaudy than the Toyota FJ but of course no car writer would dare impugn a Toyota lest they offend them. Frankly I wish the interior had matched the exterior colors instead of Black/gray or Red/black. This car still brings more looks, stares and positive comments every day than your average super car. And alas yes thanks to Obama's cash for clunkers many parts are hard to get or on a waiting list from Japan. These Isuzu's became an orphan car so quickly, it's hard to even remember who their parents were! I always liked the VehiCross but was dumbfounded to discover that they were never offered as a 3-pedal. With the short wheelbase, factory lift and nice shocks, I can't help but think this thing would have been a lightweight, cool, off road beast if it had a 5-speed. I once owned a 2-door, red Isuzu Trooper, 4-cylinder 5-speed and with the exception of the engine (which wore too quickly), I loved everything about this little truck. Always liked the way these looked. I heard that rear visibility was very limited. Still want one but have never gotten to test drive one. J.